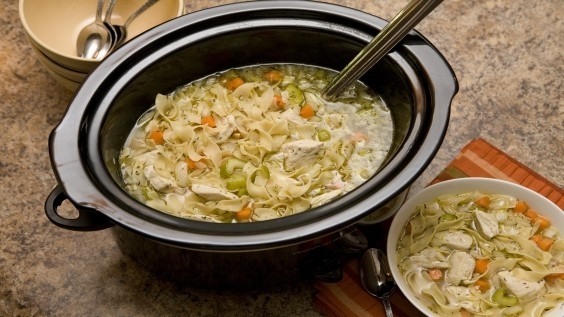 Take a bite out of the wintertime chill with a hot bowl of chicken noodle soup that has cooked all day long! The longer cook time intensifies the flavor. Spray the inside of the crock pot with cooking spray or insert a crock pot liner. On the bottom of the crock pot place the chicken breast and on top place the carrots, onions, celery, garlic, olive oil, seasonings, and bay leaf. On top of that add the chicken broth, water and salt/pepper to taste. Cover the crock pot with a lid and cook on LOW for 6-7 hours. With 10 minutes remaining, add the egg noodles and parsley (for color) and return the cover. Once the noodles are cooked, serve and enjoy!